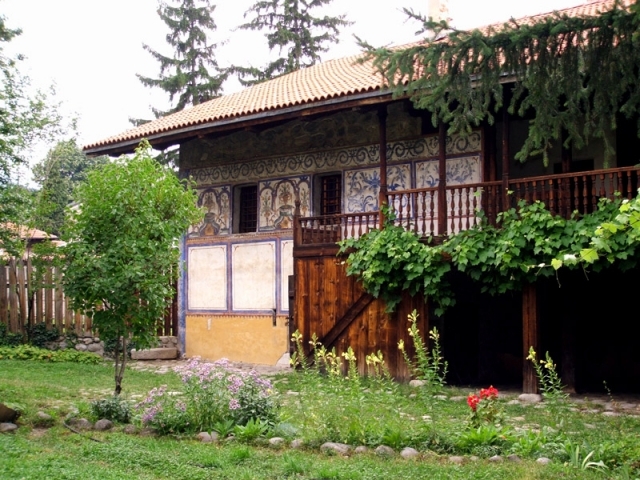 Velyanova House is one of the brightest representatives of the Bansko houses-fortresses built during the Bulgarian Renaissance and is one of the most unique works of the famous woodcarver and painter of the Debar art school – Master Velyan Ognev. No matter whether you are on vacation in Bansko or just passing by, take a moment from your time to see it with your own eyes – we assure you, you will not regret it. And until it’s time to visit it, we’ll introduce you to the interesting story of the uniquely beautiful Velyanova house. And the story begins in the middle of XVIII century with the story of two men – Ivan Hadzhiradonov and Velyan Ognev himself. The first one was a wealthy cotton merchant who, according to one of the versions, grew incredibly and decided to raise a large and spacious house for his family. Unfortunately (or perhaps not), soon after its construction the cotton business of the rich man from Bansko began to decline and he had to sell the house to the municipality. Another version of the story tells us that during one of his business trips robbers entered the merchant’s home and killed his wife. 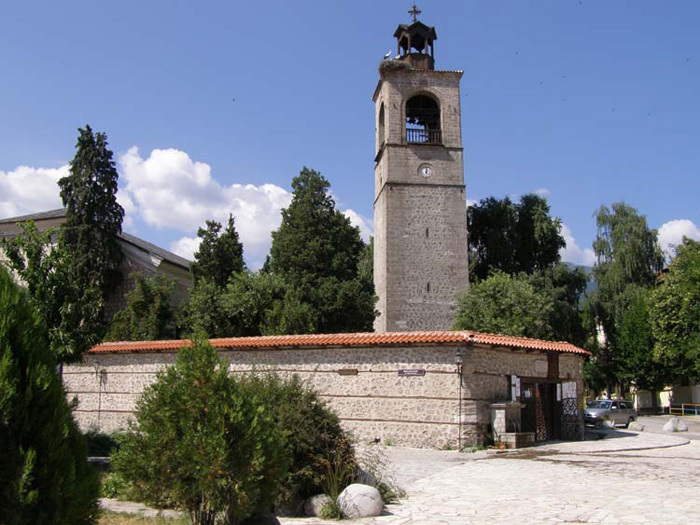 After the tragedy, Ivan Hadzhiradonov never returned to the house and afterwards donated it to the Bansko municipality. Which of the two stories is true, we are not able to say, so we go on with it. The second man in the story is Master Velyan Ognev. He was not a native of Bansko but as a master of the Debar Art School he was invited by the mayor of the city, Lazar German, to paint the newly built Holy Trinity church. The icon-painter worked diligently on his task (something you can see for yourself when you visit the church), but they say that love comes suddenly and completely unexpectedly… And so happened with Velyan and Sofia Benina (the sister of Neofit Rilski). The two young people saw each other, fell in love and got married. The municipality, as gratitude to the artist’s fine work, gave them the house of Ivan Hadzhiradonov as part of the fee for Velyan’s work on the church’s mural paintings. What is so impressive about Velyanova house? 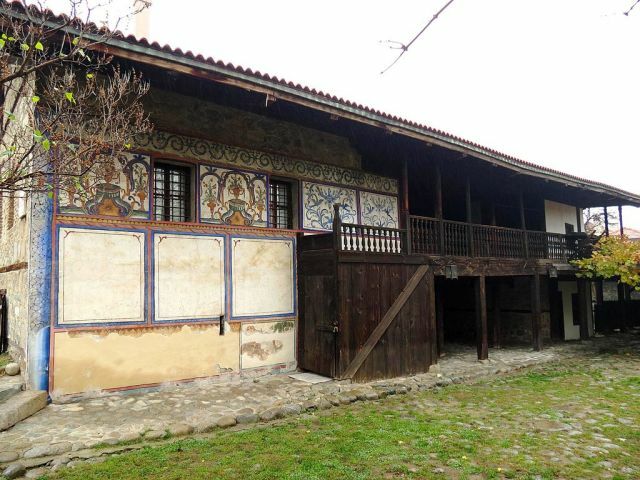 The first thing that people will tell you in Bansko about the house is that it is one of the oldest houses in Bansko and it is one of the so-called fortress houses. By the time it was built (XVIII century), Bansko was a rather rich city and a lot of Bansko people had accumulated wealth from trade. The rich houses, however, inevitably attract the interest of the robbers, and during the Ottoman rule, and especially towards the middle and the end of the 18th century, there were many of them. In order to protect themselves from raids, Bansko people began to build their houses with tall, thick walls to be able to defend themselves if necessary. The Velyanova house was built in the same way. There are thick, tall stone walls, heavy, massive wooden gates and hiding-places and escape passes. (Hiding-places and escape passes were also mandatory in that troubled time, so no one neglected them in the construction of the house). There are several hiding-places in Velyanova House that are designed in a way that makes it possible for the family to hide quickly in them, no matter in which room the family members are in the moment of danger. From all the rooms it is possible to go out to an anteroom from which to go down the stairs to the hiding-place. There is a hiding-place in the master’s room which leads to tunnels which go to the church and the neighboring Sirleshtova house. The house is made of stone and wood, there are two floors, a spacious veranda and a groud floor with a large cellar. On the first floor there was a basement and workshops and on the upper floor (the residential floor) were the female room, the common room, the mistress’s work room, the nursery and the guest room. However, what makes the house so unique are the unique frescoes, painted ceilings and incredibly fine carvings made by the talented Master Velyan Ognev. When the people of Bansko gave the house to the young family of Velyan and Sofia Benina, the master rolled up his sleeves and undertook to make it the most beautiful house worthy of his beloved wife. He paints almost entirely, so it becomes the first painted house in Bansko. The most of his dedication Velyan puts in the painting of the female room, because his beloved spent most of her day and received her friends in it. To this day the room impresses with its extremely fine and elegant frescoes that seem to illuminate everything around. Extremely impressive are two of the frescoes – from Venice and Istanbul, where the blue color is predominant and for this reason the female room is also called the Blue Room. Whether the icon-painer Velyan had visited Venice and Istanbul indeed or the frescoes were the result of his fantasy, we cannot say for sure, but it is for a fact that the paintings that came out of his hands are impressive to this day. Interesting and very beautiful is the ceiling of the Blue Room which is painted in the same way as the paintings of the ceiling of the Holy Trinity church. 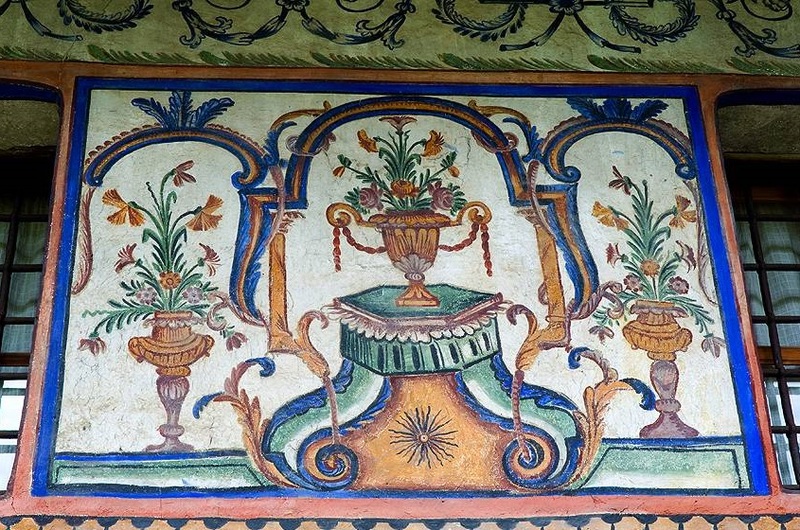 Historians and researchers are of the opinion that Master Velyan first painted the ceiling of his home and only after he had made sure that the ornaments were worthy to adorn the ceiling of the temple he had painted them there. The ceiling of the veranda, which is decorated with a unique wood-carving, is also very impressive. Traditionally, during the summer months, the Bulgarian Renaissance family spent most of their day on the open verandas, and most likely the family of Velyan and Sofia was not an exception. That is why the master has also tried to make it comfortably furnished with a seating area, a small hearth for preparing lunch, and in the ceiling made his beautiful carvings to delight the eyes of the household and the guests of the home. Interesting is the decision for the basement which the master craftsman turned into a large common room where the whole family was gathering during the winter. 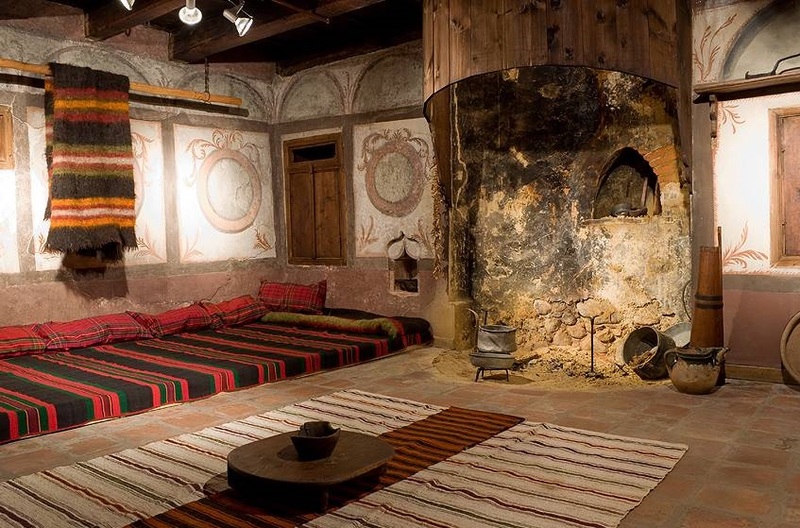 Along with the huge fireplace which occupies a central place in the room and which was used for heating, lighting and preparing of delicious meals, the painted mirrors on the walls are also impressive. The idea of the genius icon-painter to paint mirrors really made the dark basement optically brighter and the room seems to open up. When you visit the Velyanova House, pay attention to one very special fresco. One of the walls in the house has a painted pair of… wolves. What’s so interesting about this fresco? It is believed that by drawing one of the few specimens of the animal world that created families for life, Master Velyan wanted to show his deep affection and love for his wife. Or in other words: the pair of wolves symbolizes the family and the strong connection between Sofia and Velyan. We will deviate a little bit from the story in order to say that Sofia Benina was the second wife of icon-painter Velyan. Prior to her, he was married to an Italian with whom he traveled all over Europe, but the big love of the master was Sofia. We continue our walk through the next rooms of the Velyanova House. In addition to the Blue Room, the mistress’ work room was located on the upper floor and today there are various tools that Sofia (and every Bansko woman of that time) used to weave, spin, knit and sew. In this room, as well as in the nursery, there are not many paintings, but this is understandable given the fact that they are either working or sleeping rooms. Then comes the living room, which (again by tradition) was not only the largest but also the sunniest room in the house. Here, unfortunately, due to poor management by previous owners, you cannot enjoy the wonderful frescoes, as they have been almost totally erased. We can only guess how beautiful the most honored room of the Velyanova House was. And finally… If you go outside the house, you will notice the fine and skillfully painted plant and geometric motifs on the southeastern facade which will literally leave you breathless. Where is the Velyanova House located? The Velyanova House was declared a monument of culture of national importance in 1967 and in 1977 it was opened for visitors. The house is located almost in the very center of the town, in close proximity to the Holy Trinity church. If you reach the church, you will see enough signs to take you directly to the gate of the Velyanova House. If you insist on having an exact address, then it is ul. Velyan Ognev 5. The house-museum has a working time from 09.00 AM- 01.00 PM/02.00 PM- 5.30 PM (Sundays and Mondays it is closed. The entrance fee for adults is 3 BGN, for pupils and students – 1 BGN, and if you visit the house on the first Wednesday of the month, the entrance is free of charge. As part of the 100 national tourist sites, Velyanova house has a stamp but it is good to know that it is located in the house-museum of Nikola Vaptsarov. If you are a guest of Lucky Bansko hotel it will take you 6 minutes by car and 12 minutes on foot to get to the Velyanova house. The distance from the hotel to the house-museum is about 1.2 km.